January is over, the sun has been out a few times and spring is on it’s way! (I can hope right?) Several events happening here at Chroma Studios this month. We hope to entice you out to our 1st Friday art opening or one of our many Intimate Concerts this month. We are also starting a series of AMP concerts this month! Looking forward to seeing you soon! 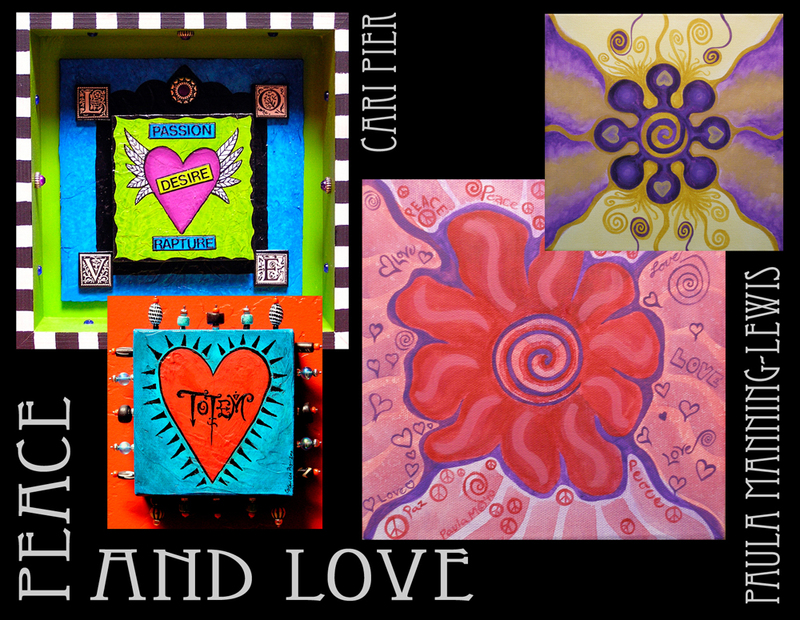 Friday, February 5th, 6-10pm: First Friday Artscrawl This month’s show is “Peace and Love” and features the work of Cari Pier and Paula Manning-Lewis. Other gallery artists are also showing work with this theme. Looking for that special Valentine’s Day gift? We have some incredible art and lots of fabulous jewelry for the one you love! Live music with the viola-guitar duo of Alicia Ultan & Tim Gaulden. ALSO, a show within a show this month at Chroma Studios Gallery! Justin Simenson, one of our favorite photographers is debuting a new series of photos & audio interviews called “Walls That Talk”. View the photographs while listening to the interviews. Friday, February 12th, 7pm: Intimate Concert Series featuring Cowboy music with Steve Cormier. After a number of years off from playing such venues as The Kerrville Folk Festival Washington DC folkcenter and The Albuquerque Museum. Steve took to acting in film and television and teaching college history. Come see his return to singing. Tickets $8 in advance or $10 at the door. Saturday, February 13th, 7pm: Intimate Concert Series featuring NYC Folk Rock with Laura Meyer on her cross country tour. “Elegant singing and playing.. a brilliant guitarist” Steve Traina WCSB Cleveland, “She made time stand still” Dan Berry , Hartford Advocate, “Delicious Gritty Guitars” David Byrne Pop Making Sense. Tickets $8 in advance or $10 at the door. Thursday, February 18th, 7:30pm: Our first AMP Concert featuring Hungrytown. Musical duo Rebecca Hall and Ken Anderson. Their deceptively simple compositions are rooted firmly in folk tradition; “in fact, Hungrytown’s music offers such an aura of authenticity–in titles and in tunes–it could be easily mistaken for original trad transcripts,”declares Lee Zimmerman of Performing Songwriter, and Rachel Nones of the Feminist Review raves “Hungrytown is American folk music at its zenith.”Early reviews of the CD have landed the group daily airplay on XM Radio’s “The Village,” and Hungrytown songs are beginning to appear on play lists across the country, including Boston’s WUMB, New York’s WFUV & Philadelphia’s WXPN. $15 suggested donation, reservations strongly encouraged! Chroma Studios is now offering custom framing services to artists and customers. If you are an artist or have 5 or more pieces to be framed, you get a 25% discount off our already low wholesale prices. We beat even the 50% off sales of other framers. Aaron has opened up his teaching studio and is currently taking on new guitar students. Aaron has a music teaching license with the state of New Mexico and has been teaching guitar to kids and adults for over 15 years. For more information see HERE. We have continued adding individual ARTIST PAGES to the Chroma web site, so far there are 18 pages completed with at least two pages going up every weekday. Shop for art on your computer, then come by the gallery to see it in person. You may also buy on line and have the art shipped to you wherever you happen to be. Chroma now represents over 50 artists, so there is a lot of great art to see. Chroma’s focus is on New Mexico artists and we are excited to show the diversity of New Mexico art available. New Pages completed since the last newsletter: Cari Pier, Justin Simenson, Tricia Simmons, Brian Vallo. Hope this post finds everyone happy and healthy! We are playing catch up after the holidays, so the Chroma Events Newsletter is running a bit late this month. Luckily, there are still a couple of events taking place in January and plenty of news for the New Year. 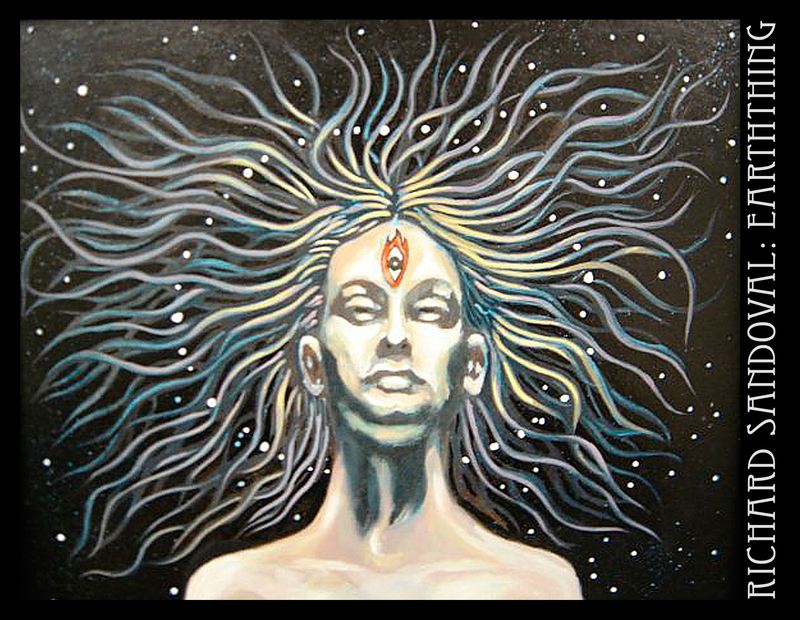 Friday, January 15th, 6-10pm: Downtown Artscrawl Artist’s reception for this month’s featured artist is Richard Sandoval. His show “Earththing” features recent and past surreal works in mixed media for the mind and spirit. Friday, January 22nd, 7pm: Intimate Concert Series featuring Diana Ivy with Jupiter Rose, duo on guitar performing Goddess Folk Rock. Tickets $8 in advance or $10 at the door. Chroma Studios is now offering custom framing services to artists and customers! If you are an artist or have 5 or more pieces to be framed, you get a 25% discount off our already low wholesale prices. However, for the month of January, EVERYONE gets our discounted price. Aaron has opened up his teaching studio and is currently taking on new guitar students. Aaron has a music teaching license with the state of New Mexico and has been teaching guitar to kids and adults for over 15 years! For more information see HERE. We have continued adding individual ARTIST PAGES to the Chroma web site, so far there are 14 pages completed with at least two pages going up every weekday. Shop for art on your computer, then come by the gallery to see it in person. You may also buy on line and have the art shipped to you wherever you happen to be. Chroma now represents over 50 artists, so there is a lot of great art to see. Chroma’s focus is on New Mexico artists and we are excited to show the diversity of New Mexico art available. Pages currently completed; Blain Anderson, Cate Clark, María de Echevarría, Brendan Gould, Kirk McGee, Scott White, té zins, Mickey Bond, Caroline Blaker, Jenny Durrett, Karl Eschenbach, Patricia Halloran, John Parish, and Julie Rybachek. (Businesses also get a mention in our monthly newsletter and a link on our website). Become a Chroma member and be entered in a drawing for a FREE 1 hour massage! Thank you so much for your continued support of Chroma Studios and the New Mexico art/music/poetry scene. Have a very happy holiday season, we look forward to seeing you soon! New York based blues and country band the Dough Rollers will play at Chroma Studios in Downtown Albuquerque tonight at 7pm, yet another great show from our Intimate Concert Series. Doors open at 7 p.m. and the show starts at 7:30. Tickets are $10 at the door. The Dough Rollers are made up of Malcolm Ford on mandolin and lead vocals, Julia Tepper on fiddle and vocals, and Jack Byrne on guitars and vocals. The band says it came together in late 2008 based on a mutual appreciation for the music of early-20th-century America. They have been playing steadily in the New York and Los Angeles areas since. The band describes its influences as including Charley Patton, the Memphis Jug Band, Gid Tanner and his Skillet-Lickers, Johnny Horton, Bob Wills, and the gospel of Professor Johnson, giving rise to a wide-ranging repertoire. Recently, they have been featured on 88.9 KXLU, Los Angeles, and AM 1700 WPMD, Cerritos, and will be playing dates nationally through the end of the summer. The band’s MySpace page is at http://www.myspace.com/malcolmandjack. This Friday is our monthly 1st Friday opening from 6-10pm. This month’s featured artist is Brendan Gould and his show “A Little Support” is a collection of his recent portrait paintings in oil and drawings in charcoal. In addition to more great new art, we will have Dave Hoover playing his beautiful harp music in the performance space.